Last Saturday morning, I sat down to do something that I increasingly rarely do: I watched a full college basketball game on television, live and in real time. Ohio State at Indiana. A couple of teams I really like to watch — players like Troy Williams, Yogi Ferrell, D’Angelo Russell and Sam Thompson – all among my favorites in the sport this season. This was a game that featured a ton of thrilling plays, a strong but unsuccessful comeback by Ohio State in the final minutes including a potential game-tying shot — many of the elements that make for a great college basketball game. And yet, for the final four minutes, I was often bored out of my mind. Why? Let’s just look at a play-by-play, including real Eastern Standard Time and game time of the final 3:37 of action in a game that, while maybe a bit on the high end of the spectrum, was not in any way extraordinary in terms of length or length of crunch time. 1:51:51 PM EST With 3:37 left, Ohio State threw the ball out of bounds and initiated the under-four media timeout. At this point, the teams still had a combined seven timeouts remaining. It would take more than 30 minutes before this game, which ended in regulation time, finally ended. 1:55:05 Ball inbounded following media timeout. 1:55:15 (3:32 on game clock) Whistle blown following a James Blackmon layup and foul. Jae’Sean Tate fouls out. 1:56:26 Blackmon’s free throw goes through the bottom of the net. 1:56:42 (3:19 on game clock) Following a Shannon Scott jumper, Thad Matta calls his first timeout of the half; he has three remaining. 1:57:57 (3:11 on game clock) Sam Thompson is fouled, and one. 1:58:28 Thompson’s one shot is through the net. 1:58:41 (3:05 on game clock) Blackmon is fouled. 1:59:31 Blackmon’s second shot is through the net. 2:00:32 (2:08 on game clock) Thompson is fouled, and one. 2:01:08 (still 2:08) Thompson misses, D’Angelo Russell rebounds, is fouled, Nick Zeisloft fouls out. 2:02:45 Sometime more than five seconds after the ball is given to Yogi Ferrell to inbound, with no time running off the clock, Tom Crean calls a timeout. He has two left. 2:03:52 Play starts following the timeout. 2:04:14 (1:54 on game clock) Russell fouls Blackmon. 2:05:16 Second shot is through the net. 2:05:31 (1:42 on game clock) Troy Williams blocks a shot and it goes out of bounds directly in front of a referee. But rather than assume the official saw what happened a foot in front of him, we have to review the play. 2:07:13 Whistle resumes play, with the review confirming what the referee saw a foot in front of him. 2:07:29 (1:22 on game clock) Matta timeout. He has two remaining. 2:09:16 (0:49.9 on game clock) Ferrell loses ball out of bounds off of Keita Bates-Diop. Official Teddy Valentine (aka, TV Ted), this time two feet away from the action, makes the correct call. To a replay we go, nevertheless. Mercifully, this coincides with a Crean timeout. 2:12:20 Whistle resumes play. The review extends Crean’s timeout by double-time and confirms what Valentine saw with his own eyes. 2:12:24 (0:48.3 on game clock) Valentine calls Blackmon for a backcourt violation. Refs correctly change the call via discussion without having to go to replay, but then go to replay to dial in the clock. For some reason, an official goes over to talk to the ESPN announcers. Back to replay to look at the clock and, well, what do you know, the officials have to add seven-tenths of a second. 2:14:20 Play is resumed. Two minutes to add 0.7 seconds to the clock. Totally worth it, right? 2:15:00 (40.7 on game clock) Russell has ball go out of bounds off an Indiana player. 2:15:19 Whistle resumes play. Nearly 20 seconds to pick up the ball and hand it to the Ohio State player to inbound. 2:15:21 No matter though. 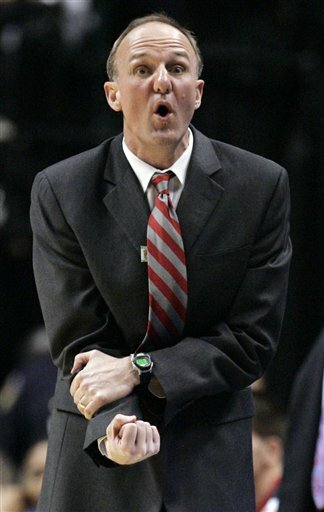 Matta calls his second-to-last timeout. 2:17:21 (32.1 on game clock) Thompson fouled, and one. Mosquera-Perea fouls out. 2:18:18 (21.9 on game clock) Ferrell fouled. 2:19:16 Ferrell’s second shot is through the net. 2:19:33 (8.7 on game clock) Russell is fouled. 2:20:25 Russell’s second is through the net. Matta calls his last timeout. 2:21:48 Whistle resumes play, Ferrell is promptly fouled. 2:22:48 Ferrell’s second is through the net. 2:22:57 Final buzzer sounds as Russell’s desperation three-point attempt is off. Actual basketball: 3 minutes, 37 seconds. Now, I love college basketball. It’s my favorite sport — so much so, that I’d gladly give up every other sport just to keep college hoops, even as a flawed product. But, my love doesn’t burn so bright that I’m completely blinded to its problems. And there are problems. Now, I’m just looking at the on-the-court issues. Clearly, off-court issues in college athletics need to be addressed too, and plenty of other people are more qualified than me to give good ideas for change on that front. Back to the floor itself, I’m not going to wade into things like the block/charge call or unbalanced conference schedules or why Ohio State feels the need to play Sacred Heart, Campbell, UMass-Lowell, Colgate, High Point, North Carolina A&T and James Madison all in the same season. But I think I watch enough college hoops — the games themselves — to have a good idea how to fix the on-court pace of play issues. First and foremost, we need to realize that this is supposed to be entertainment. In the grand scheme of things, the outcome of any individual basketball game, from Pepperdine vs. IUPUI on December 27, to the national championship game on the first Monday night in April, doesn’t mean a whole lot. These games don’t really “matter” in the same way a lot of other things in life do. To those involved in the action, professional careers certainly matter to those players and coaches and referees and administrators and on down the line. And in order for this thing to be entertaining so people like me want to watch, we ask for fairness and equal application of the rules. But the goal of a basketball game – much like a concert or a movie or a play or a night out at the bowling lanes – is entertainment. And, what is the most entertaining part of a basketball game? Is it watching coaches sit in the middle of a closed circle and giving their players instructions? Is it watching referees stare at a courtside monitor? No. It’s the actual freaking game, right? Therefore, the primary goal in terms of increasing the excitement of college basketball should be to pack more actual basketball into less time. Here’s a handful of things we can do right now to get on track to accomplishing that goal. And I’ll argue that making these changes will also filter down into improving several other flawed areas of our game. Timeouts. Let’s jump right in. There are too many timeouts. I understand we’ve gotta pay the bills so I’m not even going to argue against the four media timeouts per half. I actually think those are good ideas to break up the game into little strategic mini-battles. But five timeouts per team on top of those? Hell no. We’ll give each team two more, total. Use them whenever you like. If the accountants and executives over at the networks and league offices don’t like it, we’ll add an extra 30 seconds or even a minute to each TV timeout in order to squeeze in that precious ad revenue — whatever makes the suits happy. And that nonsense about adding extra timeouts for overtime? Ridiculous. Play an extra five minutes or an extra 30 like Syracuse and UConn and you’ll do so without any additional timeouts. You don’t get any extra fouls, so you’re not getting any extra timeouts either. Think you’ll make up for that by dragging your feet when someone fouls out? Not a chance, as you’ll see. No Game Stoppages For Instant Replay. I’ll be accused of being a Luddite for asking to forgo in-game reviews, but here’s a simple fact: There are going to be missed calls in a basketball game. Many of them. Dozens of them. You’re going to tell me that an out-of-bounds call that happens with 1:59 left in the game is somehow more important than one with 2:01 remaining? You’re not even going to convince me that an out-of-bounds call with 10 seconds left is more important than one 10 seconds into the game. Even more importantly, for keeping the entertainment value of the game high, game flow is far more important than any individual call. Get rid of these endless game stoppage, but note I didn’t say to get rid of instant replay. If we can use the technology to get calls right without interrupting the flow of the game, great! The solution is that we’ll have an instant replay official at courtside who will be ready to review things like two-point/three-point shots or the dreaded flagrant-1/flagrant-2. 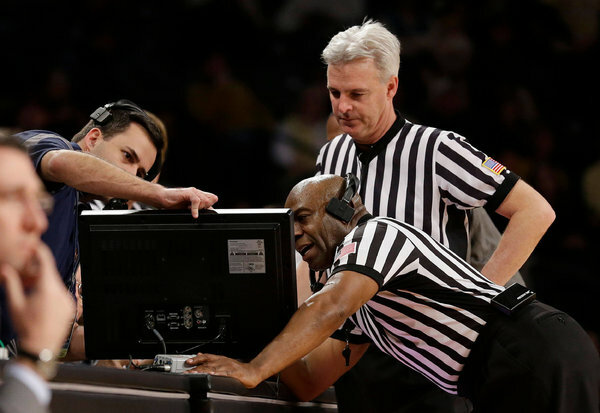 The officials on the court’s job is to keep the game moving, but the instant replay official is there to review a handful of scenarios where adjustments can be made on the fly (who to assign a foul to, as another example). Let’s Get On With It. While we’re on it, let’s get the in-game stuff moving. 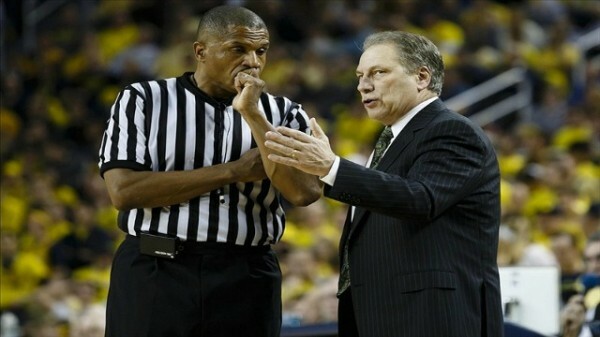 When a timeout ends, blow the whistle, hand the ball to the player, and let’s get on with it. No waiting around for guys to stroll out onto the floor. Let’s get on with it. Foul shots? Ref: make the call, get the guy to the foul line, let him take up to 10 seconds to gather himself and attempt his shot, and let’s get on with it. Substitution? Blow the horn, get one guy in the game, move another guy out, and let’s get on with it. If the sub isn’t waiting at the scorer’s table to come in when the play is stopped? Too bad, he can come in on the next stoppage. Let’s get on with it. This is basketball. This isn’t football or baseball with their interminable waits between plays (high-five to Oregon football, though). A guy fouls out and you want to waste a couple of minutes getting your next guy off the bench and into action? Not a chance. Thirty seconds after the call is sent to the scorer’s table, we’re running again whether your next man is ready or not. Technical fouls could be used judiciously for those more interested in wasting time than playing basketball. Call Challenge Option. Let’s circle back around to getting calls right. In the interest of making sure we eliminate as many bad calls as possible, let’s add a wrinkle. Both benches can choose to trade in one of their precious timeouts in order to challenge a call – any call at any time. You think a guy traveled with 15 minutes left in the first half and you want to challenge that? Go for it. We’ll just use one of your team’s two timeouts, and during that stoppage, the replay official will consider your case. When we’re back from commercial, a decision has been made and we’ve got one less timeout to worry about down the line. Because, win, lose or draw on your one and only challenge, that timeout is now gone forever. Those are the basic changes. These are not earth-shattering modifications that will alter the game as we know it, but they will make the on-court and on-television product much more palatable. There are so many options for entertainment nowadays, both at home and away from it. For college basketball to remain competitive with all those other options, the sport needs games that are entertaining enough to keep people who have never heard of Ken Pomeroy from changing the channel to Friends reruns with three minutes to go in a one-point game. What does it say when you get bored enough to change the channel during what is supposed to be the most exciting part of the game? In the end, these changes will make up for whatever minimal loss of advertising time is incurred, by drawing – and keeping – more viewers. A side effect of these changes should also be a gradual increase in game tempo. By limiting the ability of coaches to micromanage their teams – through their five timeouts or all the little stalls on dead balls – we can start to put the game back into the hands of the players on the court. And the exuberance of youth – especially ridiculously athletic and confident youths – will take over and at least earn us back a few more possessions per game. There are other changes that will still need to be handled (i.e., NBA-style continuation calls; backcourt 10-second call aversion with a timeout; and once and for all figuring out what we want to do about block/charge calls), but these simple changes related to keeping the action moving will go a long way toward opening college basketball up as a more free-flowing, improvisational game rather than the grind-it-out chess match it has become. Of course we’ll need buy-in from all levels of the game – coaches, administrators, officials, media – but I’m convinced all of these changes are in their best interests. The part about de-emphasizing in-game instant replay will get the most pushback, but frankly, I have a hard time recalling an abundance of instances in the past few years where a game stoppage for instant replay yielded a positive impact on the overall entertainment value of a game. We’re never heading back to the old days where guys like Duke’s Jahlil Okafor and Kentucky’s Anthony Davis will give us four compelling seasons of college basketball, so our sport cannot rely on developing star power to draw in and keep the fans. Rather, it needs to be an entertaining, fast-moving, free-flowing, on-court product. Right now, especially down the stretch of tight games, it isn’t. Instituting these changes can allow us to take a step in the right direction. This entry was posted on Friday, January 16th, 2015 at 12:31 pm by Andrew Murawa (@AMurawa)	and is filed under rtc analysis. Tagged: college basketball rules, endgame situations, feature, timeouts. You can follow any responses to this entry through the RSS 2.0 feed. You can leave a response, or trackback from your own site. since most of these guys want to Pro asap then change to a pro clock for them to get use to it. Could not agree more! Thank you for having the stones to write this! I run the scoreboard for a juco program and despise the last 3 minutes of any game…D1 is even worse! Speed it up PLEASE! Is something different done/emphasized during the NCAA tourney (as in media timeout length, in-game pace, etc.) because it feels to me like those games proceed much more efficiently. It certainly could be because I’m more dialed in (and have options of changing stations) but I feel like I’ve noticed that the last few years. Just wondering if there was anything legit to that feeling. What I hate is the fact that the last 2 minutes the game is almost a completely different sport. All strategies change and there is no flow. Here’s my simple solution. The last 2 minutes of the game all fouls are 2 shots plus the ball regardless of how many fouls the team has. The idea the other 38 minutes is to play defense without fouling. Let’s keep with that during the last 2 minutes. This may result in teams starting to foul earlier to keep it close but you know that at the 2 minute mark you better play true defense and be close in score. You also don’t want your best players to foul out so fouling earlier in the second half isn’t a good idea. This may lead to changing the fouls required for the bonus but ultimately I think it will result in coaches reacting differently earlier in the game and result in closer games which is better for tv. Perry, the problem with that is that in response to the game changing drastically in the last two minutes, you’re making rule changes to change the game drastically in the last two minutes. Does not compute. I have no problem with fouling/free throw shooting in the end-game scenario, because that is still a part of the game, so long as we can limit unnecessary stoppages as part of that. Andrew, I would love to see this tried out even it is just for overtime at first. Play to 8. As you have mentioned it turns into a different sport. This gets rid of fouling, clock reviews and time outs to stop the clock (or to advance the ball in the NBA). Good basketball would be rewarded; good shots, defense without fouling, etc. YES. And change to the NBA 3-point line as well. High schools, too. EARN that extra point. Great article! I totally agree, the four media timeouts per half are fine. Two other TOs are more than enough. Put the game in the players’ hands. A good coach would alreaady have given these kids at least a clue of what to do at the end of a game. And replay should be used for evaluating officials. It should not be used to slow down the game. I’m all for getting it right, but a review should never take more than 30 seconds. If you can’t figure it out by then, go with the original call.